If you are coming by car, you can park at the Rams Head Parking Garage at 330 Ridge Rd. The hourly rate is $1.75 and it is only a 9 minute walk to the Frank Porter Student Union. Please plan to pay in cash. Rams Head Deck is almost dead center in the map below. ​If you do not mind walking a bit further, you can also park in the Wallace Parking Deck (150 E. Rosemary Street) for $1.00 per hour. It is a 13 min. walk away from the Student Union, but it saves some money. You can also pay with cash or card in the Wallace Deck. 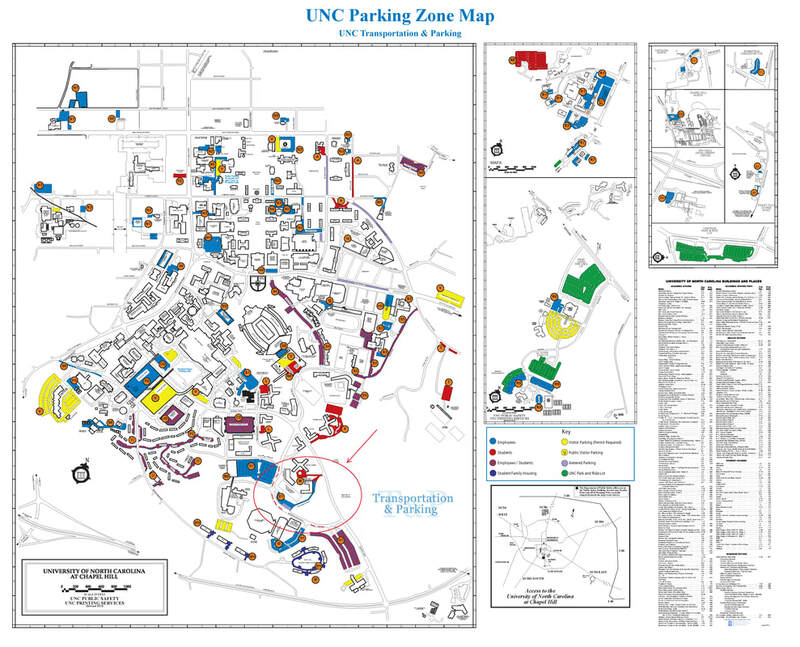 Bus Parking is located on Skipper Bowles Drive, in the travel lane in front of the Dean Smith Center. 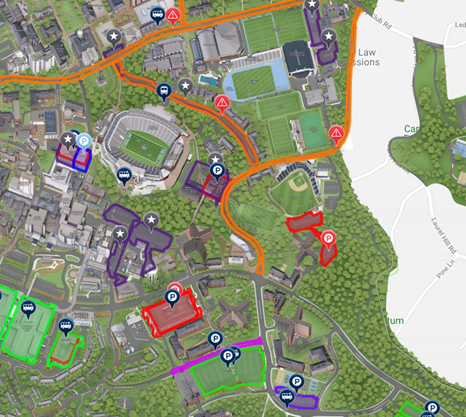 In addition to Skipper Bowles Drive, buses can park on Bryce drive (hot pink on at the bottom of the map above). There is not a charge for bus parking and you do not need a permit to park the buses. When parking in front of the Dean Smith Center, please make sure not to block the regular bus pull-in or any of the side roads or entrances. Before you proceed to park, you can stop and drop off the students in front of the Student Union. Please just be as quick as possible in order to avoid blocking traffic or incoming campus buses. Take the RU bus that stops at Bowles Dr at Dean Smith Center. You will be on the bus for 7 stops. Get off at Raleigh St at Connor Hall. From there it is a 1-minute walk to the Student Union. Turn left toward Stadium Dr.